Another week, another episode of Project Accessory! This week the designers were asked to design a clutch and one other accessory of their choice for their pre-determined looks given to them by Kenneth Cole himself. Not only will the winner get their items sold at Kenneth Cole store this holiday season, the profits go towards charity. Not a bad deal! 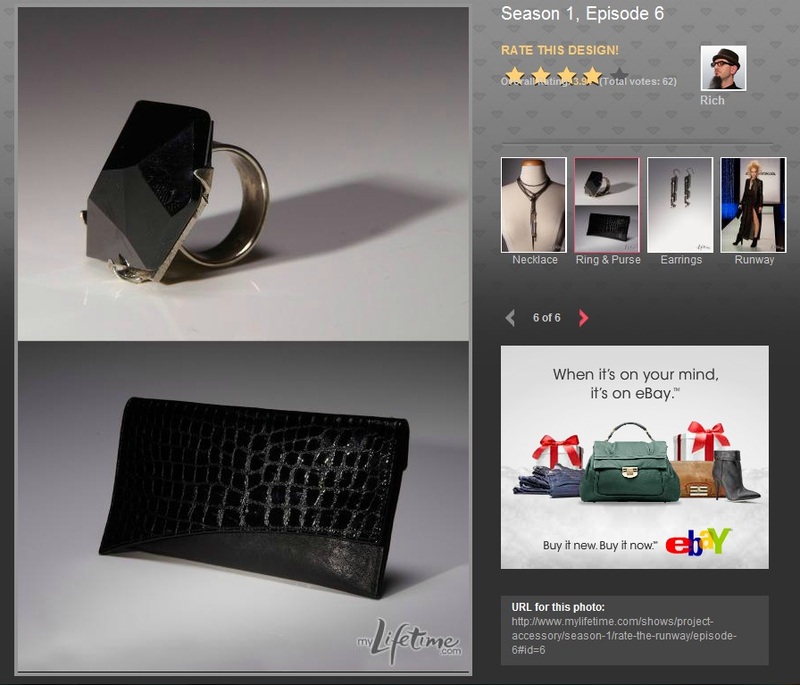 If you haven’t watched the episode yet or missed a week, you can always check out http://www.mylifetime.com/shows/project-accessory/video/full-episodes for complete episodes at your viewing pleasure! Before we get to some of the pictures and episode commentary, I wanted to just toss this idea out there. Maybe you agree, maybe not. I appreciate that Project Accessory is in its first season, they are feeling out the waters, trying something new. And that’s cool. Having said that, I would LOVE to see episodes (or content) where the designers are actually able to feature their specialty. It sounds like some people this season make hats, some make shoes, some specialize in handbags, others jewelry. But very few of them can make items from ALL of those areas. Like the guy who got into the competition mostly based on his ability to make hats. At the rate this show is going, he will never have the opportunity to really showcase his type of work. The people that really only make jewelry or MAYBE handbags seem to have the constant advantage in this competition, which is unfortunate, because there are so many other talented designers with amazing skills that are being bottled up! Anyways, I’ll leave you to decide, just something that crossed my mind while watching this episode. I have a few favorites this week to get to…. My favorite designer this week was Diego. He made some of THE prettiest earrings I’ve seen the whole season, I just had to take a few shots of them to share. His overall look was beautiful too though. I can’t believe he placed were he did in the final numbers. Rich was another favorite, I just adored that clutch! The earrings were also very pretty, but a little edgy too. For once I agree with the judges, Nina’s necklace was quite beautiful, and did actually look like it was made to go with the look. I think Adrian’s cuff was nice, nothing I would necessarily go out and buy right now, but I would wear it if I happened to have it in my collection. 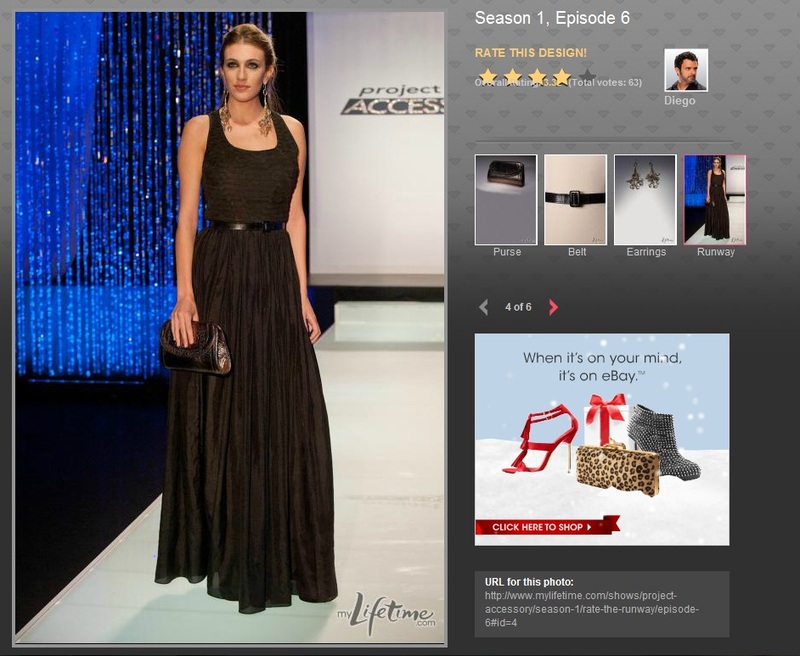 Christina made my runner up favorite look for this week with her metal earrings and purse. These would be a beautiful addition to any girl’s collection. With next week’s challenge sending home two designers, I hope it’s going to be an all-encompassing episode. We shall see!